1. Preheat the oven to 200ºC, gas mark 6. Mix together the juniper, garlic, rosemary, plenty of pepper and a little salt to make a paste. Rub the paste over all sides of the lamb. Scatter the onions in a small roasting tin. Position the meat on top and roast for 30 minutes. Reduce the oven temperature to 170ºC, gas mark 3. Cover the tin tightly with foil and return to the oven for 3 hours or until the meat is very tender. 2. Transfer the lamb to a board. Drain the onions and transfer to a bowl with a slotted spoon. Tilt the roasting tin and skim off most of the fat leaving just a little fat and all the cooking juices in the tin. 3. Pull the lamb from the bone, cutting it into chunky pieces. Discard any areas of excess fat. 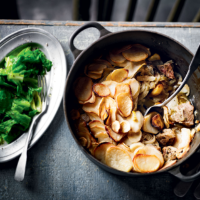 Arrange half the parsnips and potatoes in a pie dish or casserole and layer the lamb on top. Spread the onions on top of the lamb and arrange the remaining parsnips and potatoes on top. Stir the vinegar and 100ml water into the roasting tin and bring slowly to the boil on the hob, scraping up any residue in the tin. 4. Pour the juices into the dish. Cover with greased foil and bake for about 1½ hours until the vegetables are golden and tender. Serve with seasonal vegetables.